In Lisbon, where I vacationed recently, images of Fernando Pessoa were everywhere, in street art, on mugs and shirts and puzzles, even on books. This lovely tile example is near the Pantheon, overseeing the Saturday flea market where I bought my own Pessoa souvenir, a €1 tile with the image of Pessoa used on the cover of one of the many Richard Zenith translations. 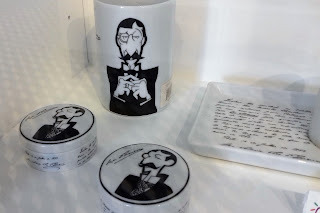 There were three different Pessoa tiles available. That seems like a lot to me. Maybe it is not. Maybe more cities than I know use once-obscure Modernist writers as their mascot, as their brand. Kafka in Prague. Others? There should be others. 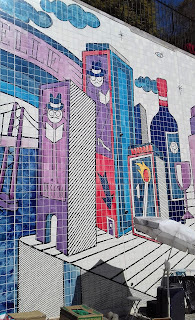 The portrait of Pessoa amounts to a moustache, glasses, and a hat, so it is endlessly flexible and instantly recognizable. Why is New York City not full of stylized Marianne Moore art? She wore a distinctive hat. She was even famous while alive. Lisbon’s pride in its writers is so great that it was easy to find souvenirs for other writers, the most thorough being a little box meant to contain a tealight; one side of the box had a caricature of Pessoa, of course, and the others had Luís de Camões, José Maria de Eça de Queirós, and José Saramago. I know that Saramago has had international best-sellers, but it is hard to believe that this is an item for non-Portuguese tourists. More Eça stuff is visible on the right. I wondered about Lyon. It should be more heavily stamped with writers. The airport is named after Antoine de Saint-Exupéry, but images of the Little Prince are rare. Even this snowy statue of the Prince and the Aviator is almost hidden, a surprise. Maybe the Little Prince is too expensive. François Rabelais is public domain. He was only in Lyon for a few years, working as a doctor in the Hôtel-Dieu, the big Renaissance hospital, and editing humanist texts with his printer friends, but these are also the years that he wrote and published both Pantagruel (1532) and Gargantua (1534). The renovated hospital is about to reopen as a gargantuan International City of Gastronomy, whatever that is, the perfect setting for cartoons of Rabelais, Gargantua, and Pantagruel. 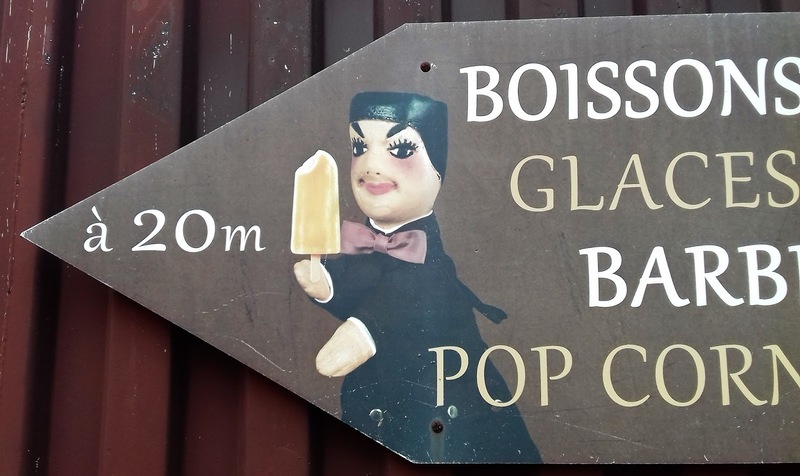 Too openly gluttonous, maybe, and anyway Lyon already has its literary restaurant mascot, the puppet Guignol, created in Lyon in the early 19th century. Although here he has a popsicle, he is normally carrying a wooden club. It makes a deeply satisfying thwack against the heads of other puppets. “Should I hit him [the pirate] again, or has he had enough,” Guignol asked the children at the performance I saw. Guess how the children responded. Guignol is a version of Punch, but friendlier and much less weird. That performance, at La Maison de Guignol, included a surprise guest appearance by another Lyon icon, not exactly literary, although he is responsible for a number of books. Please see this article in the regional paper Le Progres for the origin of the puppet of Paul Bocuse. The pirates, in this play, kidnap M. Paul for their ship’s mess, as is logical. Bocuse had died just a few weeks before we saw the play, which was not stopping anybody. They even added a line: “You can’t kill me, I’m already dead!” French theater works fast, and is ruthless. Images of Paul Bocuse are everywhere in Lyon, is my point. Maybe they will fade away, but maybe not. Maybe a hundred years from now, this will be the Platonic ideal of what a chef looks like. He is not a literary character yet, but might become one. Still, the city’s branders should make room for Rabelais and Gargantua, for the legendary gluttons who swallow of all that great, bold, heavy Lyon food and wine.